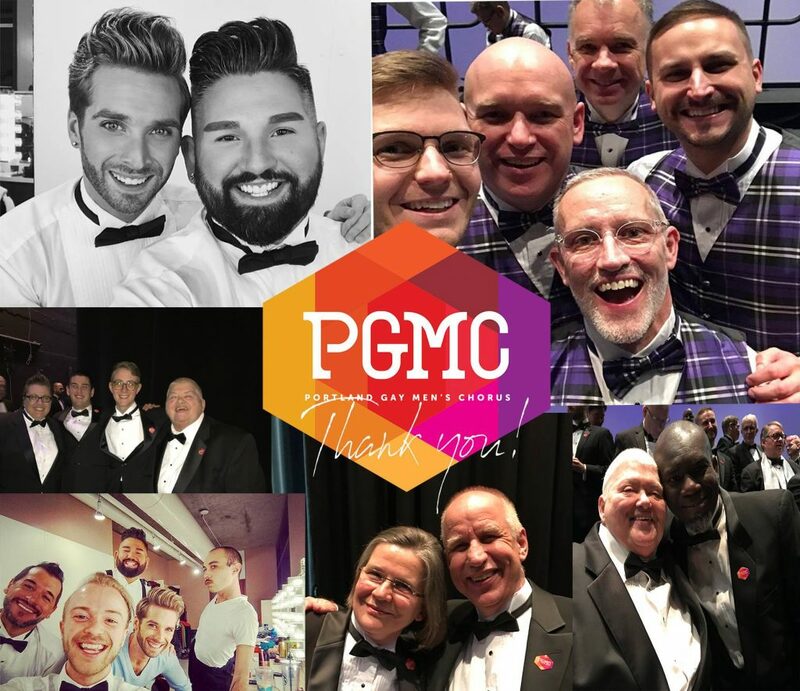 The Portland Gay Men’s Chorus inspires leadership within the gay community and is an active partner in the regional arts. The Chorus is financially and organizationally efficient. It provides an open, supportive environment for a diverse and committed family of members and supporters. The Chorus produces innovative and passionate programs that promote the mission to a varied and expanding audience. After attending a San Francisco Gay Men’s Chorus concert in the spring of 1980, Portland native Mark Richards asked friends Mark Jones and Gary Coleman if they thought Portland would support a similar Chorus. 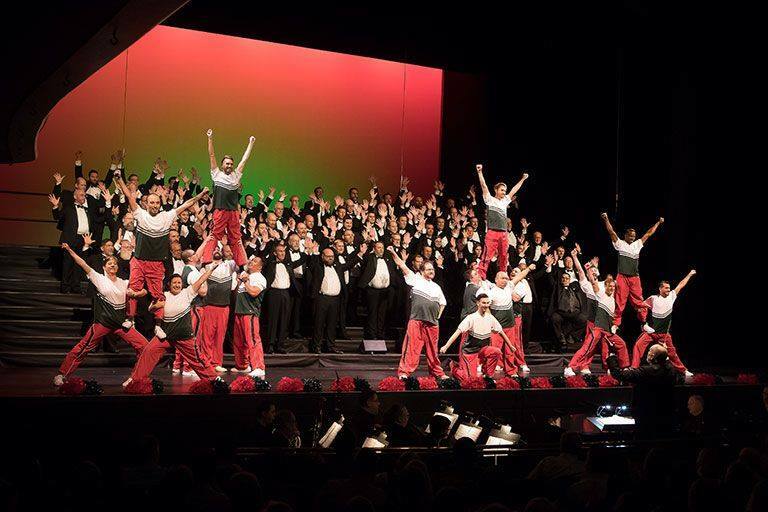 An ad in the local gay newspaper proved there was interest, and – with just 26 singers – the Portland Gay Men’s Chorus was born, one of the first gay men’s choruses in the nation. Very soon, the gay community was facing a crisis: AIDS. PGMC, which quickly grew to more than a hundred members, found itself an emotional, spiritual, and social oasis for the community, and many of its performances were at funerals for members, friends, and family. AIDS took its toll on membership, as well; the Chorus shrank to less than 30 members during the heights of the crisis. Today, PGMC is a thriving arts organization comprised of over 140 singers. The Chorus performs to packed houses in Portland and beyond, and considers outreach to be an important part of its mission. The Chorus will be the first gay performing group to tour China in the fall of 2018. PGMC has performed throughout North America from Vancouver, B.C. to Montreal, Miami, Denver, Philadelphia, San Francisco, and Washington D.C. We have also performed extensively throughout the Pacific Northwest and Mountain West, with outreach performances in sites as varied as Ashland, Bend, Stayton, Roseburg, Eugene, Grants Pass, The Dalles, Pendleton, and Salem, in Oregon; Vancouver, Tri-cities, and Longview, in Washington; and Boise, Idaho. All potential new & returning members are requested to attend the 1st rehearsal of the term on Monday, January 8th from 6:30 pm – 9:30 pm at Westminster Presbyterian Church, 1624 NE Hancock, Portland. Come early to pick up music. Auditions will be scheduled Saturday, January 13th 10 am – 2 pm. The Portland Gay Men’s Chorus aspires to expand, redefine, and perfect the choral art through eclectic performances that honor and uplift our community and affirm the worth of all people. Portland Gay Men's Chorus shared a link. Sadly, our outreach concert in Grants Pass was met with some angry protesters. Part of PGMC's mission is to engage and uplift our neighbors with music, even when we know they may react in these ways. Since its earliest days, PGMC has been doing outreach to affirm the worth of ALL people across Oregon (and now the world!) and nothing can stop us from sharing that love! Portland Gay Men's Chorus is with Cynthia Butts. Thanks so much to all who came to see The Most Wonderful Season! It was our largest audience, EVER. Thanks to you! Happiest of Holidays from all of us!